The Center for Liberal Studies – Markos Dragoumis (KEFiM) is pleased to invite you to attend our first event for 2019. 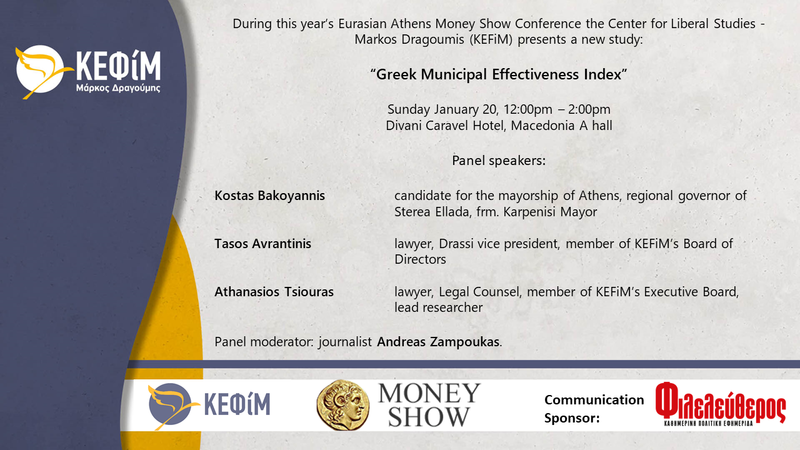 Inspired by the Lithuanian Municipal Performance Index, KEFiM presents it’s new study, the “Greek Municipal Effectiveness Index”. The event takes place during the Forum of Municipalities and Entrepreneurship of the Eurasian Money Show Conference Athens 2019. Panel moderator: journalist Andreas Zampoukas. Note: The discussion will be held in Greek. What is the Municipal Effectiveness Index? The Municipal Effectiveness Index ranks the performance of municipal governments in three key categories: financial management, transparency and accountability and the services offered to the public. The Index identifies best practices and highlights the positive examples of municipal governments that have managed to make effective use of the resources available to them, amid the bureaucratic restrictions of the current regulatory framework. This research was supported by Friedrich Naumann Foundation (FNF).